Digi-Schlock: DARK NIGHT OF THE SCARECROW (VCI Blu-Ray) – Schlockmania! VCI’s DVD edition of Dark Night Of The Scarecrow was an unexpected surprise for horror fans last year, offering a superb transfer and a few worthwhile extras put together by the film’s writer/producer J.D. Feigelson. VCI has gone back to the well for a blu-ray update of this popular title. Thankfully, this is not just some double-dip: it’s a genuine improvement on something that was already pretty good in both the a/v and supplement areas. The blu-ray presents the excellent master used for the last edition in all its high-definition glory and the results are fantastic. The detail is sharp as a pin and the colors really pop. The addition of uncompressed sound capability gives an added boost to the audio. Both 2.0 and 5.1 stereo mixes are available: the 5.1 was used for this review and it’s a very robust mix. The eerie Glenn Paxton musical score benefits from the way it is opened up on this track. Surround effects are limited but very effective when they are used (listen out for those birds after the big shooting scene). 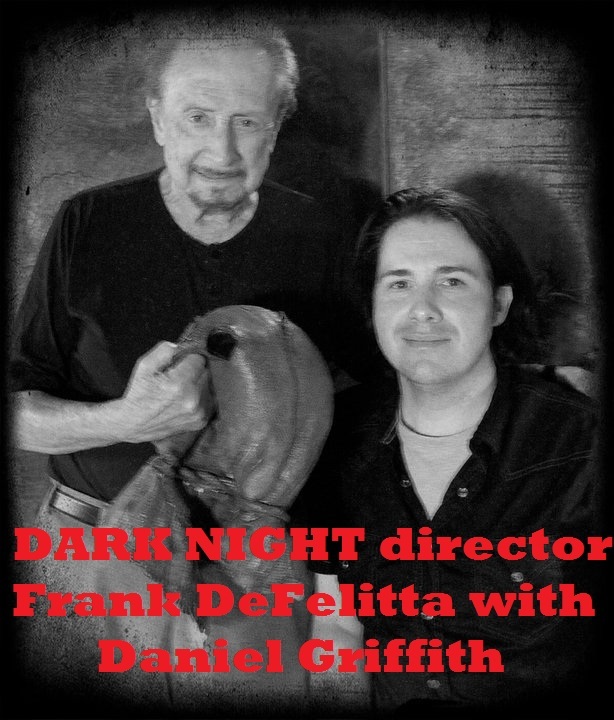 The extras from the original disc – a commentary track with Feigelson and director Frank DeFelitta plus an original network promo spot – are both retained here (check the link below for Schlockmania’s original coverage of these extras). However, the big news is that VCI has added a complement of fresh extras that really boost the value. For starters, this set features a full-color booklet that showcases an in-depth essay from genre scholar John Kenneth Muir. True to Muir’s style, it’s a very thoughtful blend of interpretation, interviews and facts. On the small end of the scale, there’s a ten minute animated gallery of production photos, including several interesting candid shots, and network promo from a 1985 rebroadcast that offers an interesting variation on the original “trailer” used for this film. The heart of the new extras lie in two featurettes. The first is a 46 minute Q&A session from a Kentucky film festival that features Feigelson with stars Tanya Crowe and Larry Drake. The material the group covers overlaps with the info covered in the commentary and the making-of featurette but fans will enjoy seeing the cameraderie between these collaborators. Drake adds a few interesting bits not available in the other supplements, like how he prepared for shooting his scenes on L.A. Law (in which he played a Bubba-esque character). The best of the new additions is the other featurette, a snappy making-of piece entitled “Bubba Didn’t Do It!” This segment was masterminded by Daniel Griffith and offers a fast-paced spoken history of how Dark Night Of The Scarecrow came to be. It incorporates fresh interviews with Feigelson, DeFelitta, Crowe, Drake and actor Robert Lyons as well as input from crew members and even fellow filmmaker/fan Stuart Gordon! Lots of interesting material is included here, including how Ray Bradbury was a mentor to Feigelson and how the hat Lyons wore in the film influenced his approach to his character(!). Griffith organizes his material well, breaking it down into chapters to cover each phase of production, and pacing it sharply like a good narrative. It’s a gem of a featurette, one of the best Griffith has done thus far. In short, the great a/v quality and added features (especially the making-of piece) easily justify the modest retail price. VCI has done a job to be proud of here – this is an upgrade that fans won’t regret investing in. 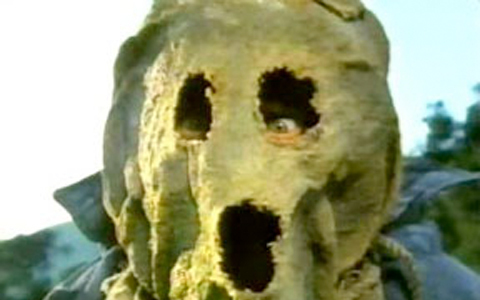 To read Schlockmania’s film review of Dark Night Of The Scarecrow, click here. 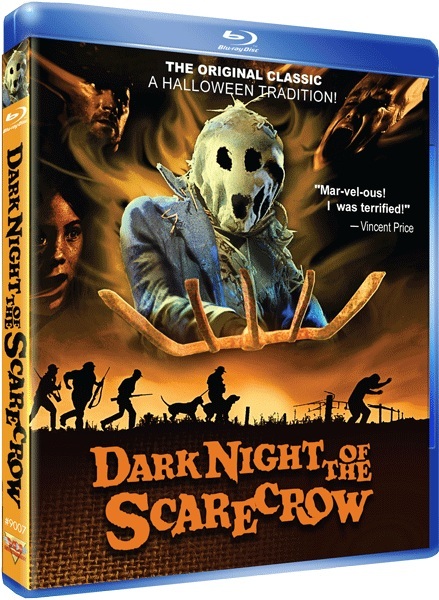 To read Schlockmania’s DVD review of Dark Night Of The Scarecrow, click here. Next ArticleTHE EXTERMINATOR: The Grindhouse Answer To TAXI DRIVER?